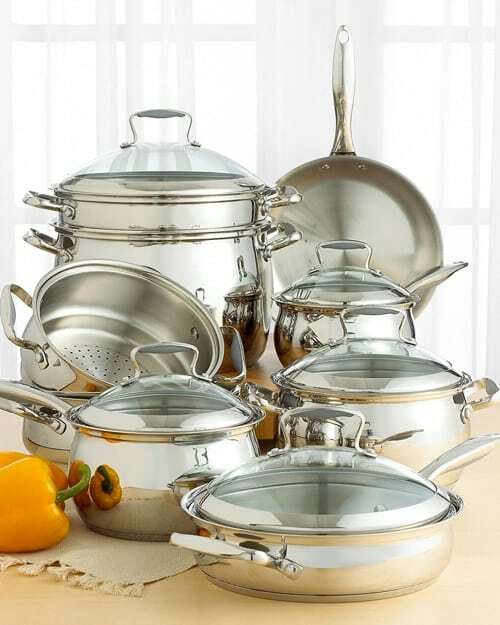 Tools of the Trade Belgique Stainless Steel is an essential 14-piece cookware set. It comes with 3 different types of inserts for you to diversify your meals and enjoy features you have never used before. The copper bottom is one this set’s main features. It is known that copper is an effective heat conductor, so you will save energy right from the beginning. 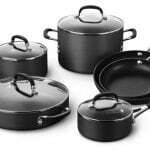 And because it is such an effective heat conductor, if you cook with the temperature too high, it will quickly stain the bottom of your pots and pans set. So it practically makes you cook at lower temperatures. This can not be better, since you save energy and at the same time the heat spreads evenly and cooks the food faster. Compared with stainless steel bottoms, the copper bottom stays heated longer and retains the heat much better. All 14-pieces are beautifully shaped. Resembling the form of a bell, the pots are quite chic. Smartly designed, the handles keep your hands away from the heat of the pots and pans. The silicone used for the handles could not be a better choice. 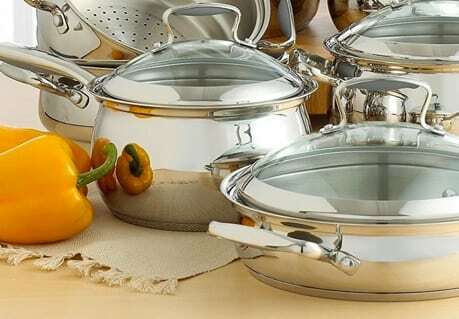 Since 2002, the Belgique Stainless Cookware has been manufactured by Macy’s Merchandising Group. Belgique is actually a private brand owned by Macy’s. It is a company that sells all sorts of products and has numerous department stores open. The history of Macy’s started in 1843 and it has grown ever since. The idea of expansion was present from the foundation of this company. Rowland Hussey Macy was the founder of Macy’s. He has contributed the most at his company’s expansion. After numerous failures, he finally succeeded in New York. Today, Macy’s offers a dazzling offer of products, from clothes and accessories to cookware, luxury linens and mattresses. Attractive shape and shiny aspect – Looks might not be all, but they definitely make a difference. 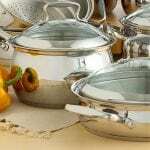 Women will love the bell-shaped pots and they will enjoy the presence of shiny objects in their kitchen. Made of stainless steel and copper – The super-resistant stainless steel makes an unbeatable combination with the super-heat conductor copper. The pieces are durable and energy-saving. 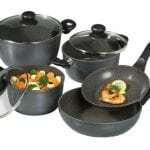 Non-stick properties – When used properly, nothing sticks on the bottom of the pots and pans. A little olive oil is recommended from time to time. 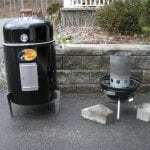 Balanced weight – The stainless steel construction does not make the pieces heavy. They are normal weight and balanced in relation to the handles. Water in between – Some customers have noticed water in the space between the glass and the stainless steel from the lids and, also in the space between the handles and the sides of the pots. This inconvenience can be easily avoided if you let them drain well. 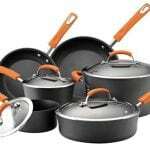 Not for high temperatures – The copper bottom can be easily destroyed if the pots and pans are exposed to high temperatures. 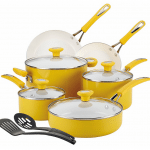 The Tools of the Trade Belgique Set is a quality acquisition for your kitchen. Nicely shaped and energy-savers, these pieces deserve a try. Once tested, you can use them for a long time.